The bill was inspired by the family of a murdered child who encountered the man charged in her death out in public. AUGUSTA – A pair of State House leaders said Tuesday they want to advance a bill that would change Maine’s constitution to provide for the rights of victims of crime. The bill, co-sponsored by Senate President Mike Thibodeau, R-Winterport, and House Majority Leader Erin Herbig, D-Belfast, is part of a nationwide effort after a California mother encountered the man charged with murdering her daughter, Marsalee “Marsy” Nicholas, while the suspect was free on bail in a grocery store in 1983. Nicholas’ brother, a California billionaire, has bankrolled a nationwide effort to see states change their constitutions. 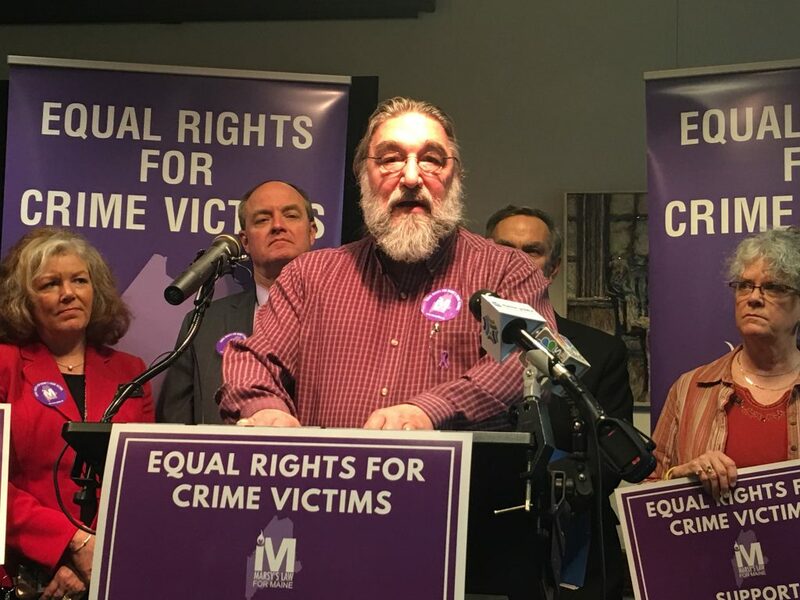 The bill, dubbed Marsy’s Law for Maine, would present Maine voters with the opportunity to vote for a constitutional amendment that would enshrine seven rights for crime victims, including the right to be notified when the custodial status of a suspect or convict changes. Other rights include a right to restitution, a right to be notified about major developments in criminal proceedings in court, a right to be present at court proceedings and a right to be heard at plea or sentencing proceedings. The change also would give victims the right to be notified of the services that are available to them under Maine law. To amend the state constitution, the bill needs to be approved by two-thirds majorities in both the state Senate and House of Representatives before being passed by voters during the next statewide elections in November. Thibodeau said Maine is among only 15 states that don’t constitutionally protect the rights of victims. While victims’ rights are protected in state law, that law is flawed as it repeatedly states the rights of victims will be afforded whenever “practicable,” and it is frequently disregarded, said Arthur Jette, the leader of the Maine chapter of Parents of Murdered Children. Jette’s grandson, Treven Cunningham and the toddler’s babysitter, Mindy Gould, also the best friend of Jette’s stepdaughter, were both shot to death in 1999 by an estranged boyfriend of Gould’s, who was later convicted in the killings and is serving two life sentences. Jette said he told reporters after the 2001 jury verdict for the man convicted of the homicides, Jeffrey Cookson, that it was time Cookson got what he deserved. In 2014, the Maine Supreme Judicial Court rejected an appeal by Cookson that additional DNA tests could have shown someone else committed the crimes. Herbig said the measure, L.D. 1168, was broadly supported by Democrats and Republicans. Legislature’s Criminal Justice Committee will hold a public hearing on the bill in the weeks ahead and that the committee will work out many of the details, including considering possible costs to the court system or other considerations, she said. “I’m confident that we can all work together to get a good outcome here,” Herbig said. The bill has not yet been scheduled for a public hearing.